The crocheted V-stitch (abbreviated V-st) is so called because it resembles, well, a V. Shell stitch (abbreviated shell) is versatile; you can find shell stitch just about anywhere. V-stitch: The versatile V-stitch can create stitch designs that are open and lacy or tight and compact. To create a V-stitch, work 1 double crochet stitch, chain 1 stitch, and work another double crochet stitch, all for a single stitch. In crochet-speak, you write this process as (Dc, ch 1, dc) in the same stitch. 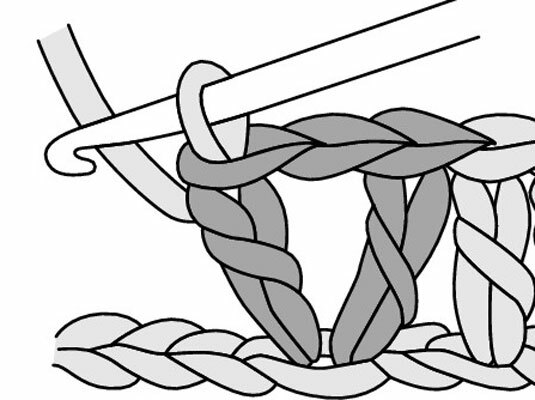 Check out the V-stitch symbol as it appears in crochet stitch diagrams. 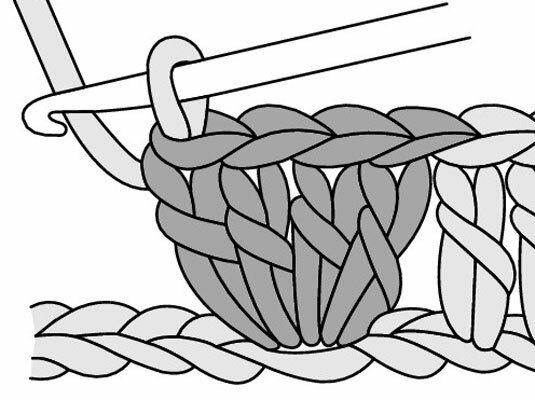 Shell stitch: This is an adaptable stitch with many variations. To make a shell stitch, work 4 double crochet stitches in the same stitch. Here’s the shell stitch symbol as it appears in crochet stitch diagrams.